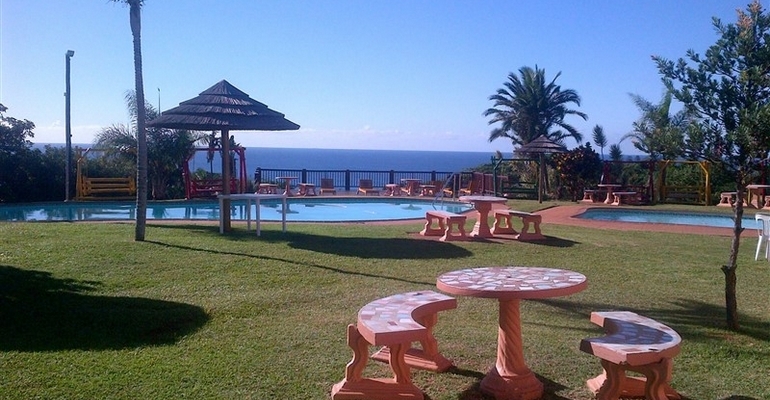 Umzumbe Chalets is popular and well maintained holiday resort offering comfortable and affordable self contained chalets in a beautiful forest type setting with stunning views of the ocean. The resort consists of over 50 chalets and has a number of A-frame, 3-bedroom chalets that sleep 6 and some newly built and modern units that also have 3 bedrooms, 3 bathrooms and sleep 6. Enjoy the peace and tranquillity of the unhurried and relaxing atmosphere at the recreational area with its sweeping views over the ocean. The sparkling pools, fully equipped lapa with communal braai facilities and recreational hall will surely keep young and old busy! The resort also boasts a Beauty & Hair Salon, 2 jacuzzis, Restaurant, Bar, Gym and Steam bath facilities. Perfect for enjoying a stress-free holiday.